Don’t be too shocked, we finally got the boots on again and made it across to the Isle of Arran yesterday. As you know, I’ve wanted to get back to Glen Rosa for the last couple of months but the extremely poor weather has until yesterday, kept us at bay. Have to say that it didn’t look altogether promising as we disembarked from the ferry in Brodick at eight o’clock yesterday morning ….it was absolutely pouring down with rain and we got quite wet just getting the 100 metres to the waiting room where we’d planned to don the waterproofs. Of course by the time we had all the gear on the rain had passed and as we walked along the promenade the first breaks in the dark cloud were appearing. It’s always a good walk from Brodick to Glen Rosa and well worth doing just for the spectacular scenery but this trip was a working one. With the plans for creating a big Glen Rosa drawing all arranged with the Harbour Arts Centre in Irvine later in the year, I needed to get back to the glen in order to start planning how exactly I’m going to do the piece. Yesterdays visit to the glen was to look at and record the first half of the glen. I wanted to spend time looking and thinking and making a few simple sketches. 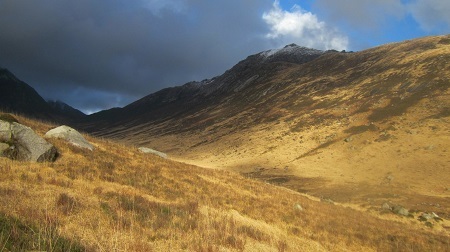 As we entered the glen a Golden Eagle flew overhead, low enough for me to see it ….it made a good start to our day. Up to this point it had been difficult to know quite how much snow there was on the hills as the cloud level had been very low, but things quickly improved and we started getting glimpses of Beinn Nuis and Beinn a’ Chliabhain, the summits of both looking white and wintry. 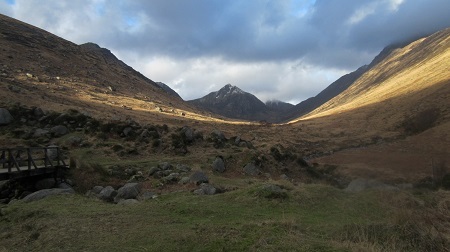 A little further on and the glen swings around to the NW and at this point the views open up even more and the fine peak of Cir Mhor stands dramatically at the head of the glen. With the cloud rising and breaking and the periods of blue sky and bright sun increasing, we got some wonderful views and the colours were really quite intense at times. I spent a lot of time standing or sitting doing some quick sketches as we made our way up the footpath at the side of the river. Nita was busy taking photos and was particularly interested in the river that was full and busy but with incredibly clear water ……in the bright sun the patterns of the rocks underneath the water looked wonderful. It was a very profitable day and I got a lot of information in the way of sketches and photographs. I’m still not one hundred per cent sure how I’m going to do this big drawing but I have come away with a much better idea. Now I need to get up to the head of the glen and record that section.